Today’s software updates for the iPhone and iPod touch are welcomed refinements from Apple. Are they earth-shattering? No. They’re incremental, carefully thought out, and point to what we can expect in the future. One thing we can expect is that Apple isn’t going to roll out a bunch of half-assed features that users may or may not need or want. It’s frustrating — we see the potential and we all want more now — but Apple is going to make sure whatever changes are made, whatever new features are added, they will improve the product, user experience, and the platform that’s being built. It’s a platform that competitors are no where near duplicating. By the time competing manufacturers introduce their versions of the iPhone (many of which may use Google’s open mobile operating system Android), Apple will unveil even more refinements as well as introduce iPhone 2.0. 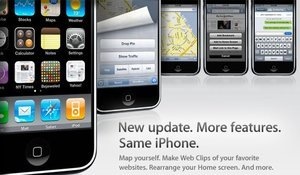 In February, Apple has said it will release a software developer’s kit (SDK) for third-party application development. This could be scary, a free for all, but Apple developers are known for elegant software design. If they follow Apple’s lead for the iPhone (guided tour) and iPod touch (features list), there should be little reason for concern. Until then, we have incremental, refined upgrades. last100 takes a look at these from the January ’08 update. 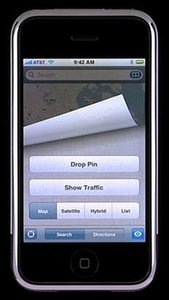 Maps is one of the most used programs on the iPhone, so it’s logical that Apple would improve it before other applications. With this update, Maps is much more polished and, for me, has moved beyond novelty status to an application I will use more often. In the lower left corner of the application is a location button, which finds you by triangulating your position with nearby Wi-Fi base stations or cellular towers. It’s a handy feature, especially if you want to use it as a starting or ending point or to find local points of interest. Once a route is established, Maps takes your location and estimates the distance and traveling time against current traffic patterns. In the lower right corner is the nifty “page curl” button, which pulls back like paper to reveal more functions. It’s nice not having to dig down into the interface to find often-used features. Here you’ll find the new Drop Pin (to refine or add additional locations), Show Traffic, and views for Map, Satellite, Hybrid (major streets overlaid on the satellite map), and List. My question here is how accurate are the traffic projections? Once you’ve established driving directions from Point A to Point B, the route is presented. Along the way are pulsing red (congested), yellow (slow) and green (clear sailing) segments, indicating traffic patterns. If accurate, this could be valuable real-time information for commuters and a reason to use Maps daily. One of the chief complaints about the iPhone has been users are stuck with the home screen and cannot organize and customize to their liking (unless you hack the phone). It’s no longer an issue. In Safari, a plus sign appears at the bottom. Tap it and you are given an option to add a bookmark, add to home screen, or share the page through email. If you select add to home screen, an icon is created, you are given the opportunity to name the shortcut, and when finished the icon appears. You can also clip a portion of the screen. With new icons on the home screen, organization is necessary. The update gives users up to nine pages of 15 icons each (in anticipation of the coming third-party apps). To thumb through the pages, simply swipe the screen like you’re looking at photos on the iPhone or touch. If you want to re-arrange icons or move them to another page, tap and hold an icon for a few seconds. The icons begin wiggling — a really fun, unexpected way to start the process — and move the selected icon to the location you want. 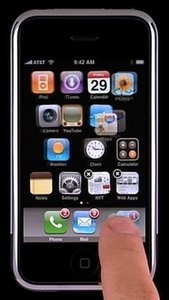 When done, press the home button and the wiggling stops. The update allows you to send SMS messages to multiple people, which comes in handy when you need to send the same text to a bunch of friends or the wife and kid. Since the iPhone saves the messages and remembers the recipients, it’s easy to send additional notes to the same groups. With the last update, an icon was added to give users access to the iTunes Wi-Fi Music Store, allowing them to order music directly from the phone. One small improvement here is that you can now pay for your purchases by redeeming gift cards (entered at the iTunes store), particularly valuable for parents who don’t want to give their kids a credit card. While you cannot purchase or rent movies or TV shows directly (download times would be considerably long), Apple has made it easy to rent content through iTunes and transfer it to the iPhone. When connected to iTunes, a video tab appears. Select the movies you want to transfer and sync. On the iPhone side, content is distinguished as purchased or rented. As movie rentals on iTunes are timed — 30 days to watch from the time it’s rented to a 24-hour window to watch — the interface lets users know how many days are left until the movie expires. The update also allows users to navigate movies by chapters, just like they can when viewing DVDs. Existing users may balk at having to pay $19.99, but the upgrade brings the iPod touch more in line with the iPhone. A new iPod touch shipping from the factory will include the upgrade. Added to the touch are applications found on the iPhone — Mail, Maps, Stocks, Weather, and the new iTunes Movie Rentals and Web Clips. Of course to use these (except for Movie Rentals), users will need Wi-Fi access. Mail was the app most touch users clamored for. They can now configure Mail for .Mac accounts, Google’s Gmail, Yahoo! Mail, and most POP- or IMAP-based mail services. Stocks and Weather remain unchanged from the iPhone. 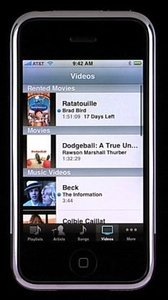 Maps, Web Clips, home screen customization, and the iTunes Movie Rentals function the same as they do on the iPhone described above. I really think that though this piece of the announcement was really buried, it will ultimately change the way we all think about our environment.